began pointing out all my old habits of incorrect english grammar, i find it more difficult to write in english. i am very glad that he is teaching me, but i've built a little wall, preventing me from writing more often, which i would really like to be doing, so i am facing some english writing dilemmas. and there is another obstacle in the way of my english writing. each time i write an engish text for my blog, i would like to post it immediately, but that's just not possible, i do not feel comfortable posting it with my mistakes, and i have to wait for mango, when it suits him, so's he can correct my grammar mistakes. we do it always together, so i can see what i am doing wrong, and it is a useful part of my learning. the process of my learning is a bit slow, because my incorrect english grammar is very old and very engraved in my brain. so these are the reasons why i do not write much any more. i am hoping to work on it and tear those walls down and write more often. the truth is, the time is near, when i am not going to have much time for writing. i am leaving on the end of this month, for some time to see my family and friends and will be really busy with little time for any pc stuff. i would use it only for keeping in touch with mango. me and mango, we are enjoying a lot of yummy fruits, enjoying sharing our fruitarian lifestyle. 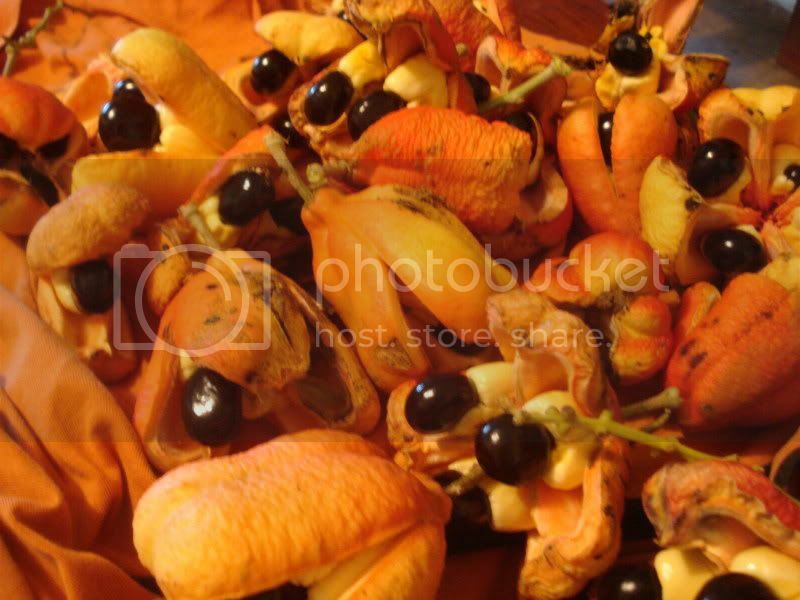 we are eating mostly red paw paw, lots of akee - our other very favorite fruit on the top of the list of our favorites right next to the magical durian. fresh durian yum, yum, yum. passion fruit, we ate heaps of white nectarines, but their season is almost over and they are not so tasty any more. we are also eating a lot of a very sweet grapes, very sweet and creamy cucumbers, yummy tomatoes and avocados. we are eating a bit less of rambutans, lychees, jackfruit, mangosteens..
we are drinking lots of oranges, cucumbers at times with a dash of tomato, grapes, apple and orange, pineapple, rockmelons and sometimes watermelon, but i drink more than mango, he is not so keen on them, and i also drink watermelon rind all by myself. i am sure i forgot some kinds of fruit we are eating, drinking, but i do not want to sit here and think about it, i just want to keep on writing. the garden is very happy, we are getting a fair bit of rain with yummy sunny breaks, and we are happy too, watching all our plants growing slowly everyday. the first cucumbers are going to be ready for harvest very soon. today we were admiring tiny babies of akee trees. lots of paw paws coming out as well, and some small paw paw trees transplanted from fruitopia that have picked up and growing very quickly and they are healthy. we also planted and are watching tomatoes grow. soon after we moved into this house, i got some nice big aloe given to me and three of them are ready to flower soon, and some of them are having babies. our garden gives us a lot of beauty, excitement and fun. we enjoy swimming in the nearby barron river. i love rivers, i spent so many years by the coast, that i forgot about how much they used to mean to me. i am grateful to have them back in my life. 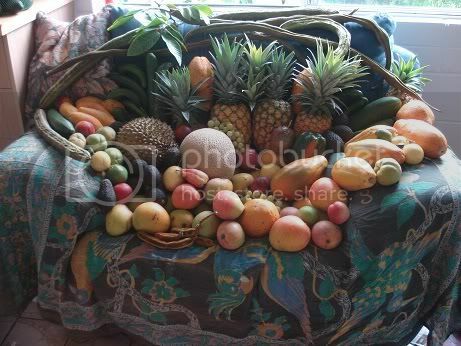 i love to arrange our fruit and take pictures. Please keep writing your fruitarian journal. Your english is very good, and your blog is my absolute favorite. I started reading it when I was very sick and I always thought of it and it helped me to get better and recover. The simple beauty you see in life is inspirational! Avacados agreeing with you then these days?? yes, don't let your imperfect english grammar keep you from writing. practice is the only way to get good at something. studies have shown that it takes 10,000 hours to master a skill or art. so just keep practicing. enjoy your visit back home. thank you for letting me know, that my writing has helped you to recover, and that you find it inspirational. i will write as much as i can. i also had a look at your blog, and i wish you all the best for your future, hopefully settling in mexico, so you can enjoy sweet yummy fruits without limit. esmee, you are so right, repetition is the key to successful learning. thankyou for reminding me. i will try to write more often. You write beautifully from the heart - keep it up! I hope your English doesn't become too perfect. I would really miss your special and unique way of expressing yourself. It is beautiful and charming. oh, julie, don't worry, i am only trying to improve my english grammar, definitely not the way i express myself. Durian is so expensive here, and seeing many of them on that table makes me think of a grand feast. I saw your lovely Durian, which is something I'm looking forward to try. Do you live in sweden? And if that is the case, where do you live? In last few days I have discovered both yours and Mango's blogs, and I truthfully cannot stop reading them! I feel as though I can relate to every word you say, there seems to be no better form of nutrition than fresh fruit. I feel so blessed to have found your blogs and I will be continue to closely following them! Thank you for everything that you are! 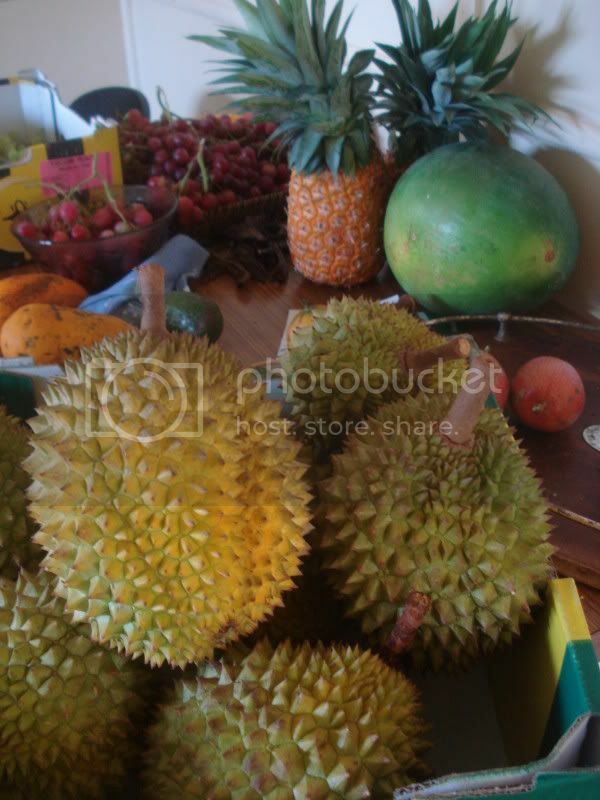 nice to see you tinah, well, we are blessed, that is our choice, durians here are also very expensive, $10 a kilo. we prioritise and allow ourselves to indulge regularly while the season is going on. wow to magic durian!!! hi amanda, i am unsure what gave you the idea that we live in sweden or are from sweden, we are in north queensland australia and neither of us are. i am originally from the czech republic. is durian available in sweden? let me know what you think after you've tried one. i am very glad you found us, and you agree with the fruitarian lifestyle, it is nice to know there are other fruit lovers taking good care of themselves and the planet earth.